The Old World monkeys occupy a wide variety of environments in South and East Asia, the Middle East, Africa, and even Gibraltar at the southern tip of Spain. Some species inhabit tropical forests, while others live on arid grasslands and even mountainous areas with heavy winter snows. There are at least 78 species of Old World monkeys in two subfamilies---the Cercopithecinae and the Colobinae . Monkeys in both groups are relatively large, being about the size of small to medium-size dogs. Most Old World monkeys are cercopithecines . Included in this subfamily are the baboons , mangabeys , mandrills , guenons , patas monkeys , and macaques . These are all African species with the exception of the macaques which also live in Asia and Gibraltar. Many species of cercopithecines sleep in trees or on cliff faces and spend their days in large groups foraging for food on grasslands. Among the most familiar of these semi-terrestrial monkeys are several species of African baboons. The semi-terrestrial cercopithecines are usually very sexually dimorphic. In these species, adult males are often twice as large as females and much more aggressive. Male savanna baboons grow up to 80 pounds (36.3 kg.) and have powerful jaws with long canine teeth. These are effective weapons in defense against predators and competition with other males for mates. 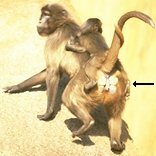 Baboon hunts baby gazelle--video clip from PBS "Clever Monkeys"
The cercopithecines share two other identifiable anatomical characteristics--ischial callosities and cheek pouches. The latter are cheeks that expand rather like those of hamsters to allow the secure temporary storage of food. This is a useful trait for these omnivorous monkeys since they compete with each other for desirable foods and are not inclined to share. Fruit and meat are particularly prized. Large male baboons aggressively hunt other monkeys, young chimpanzees, and even flamingos for food. The females in some of the cercopithecine species develop prominent sexual skins around the time of ovulation. This is a signal to males that they are sexually receptive. The most biologically successful monkeys are the macaques. They occupy the widest range of environments from the dry grasslands of Africa to tropical forests of South Asia and cold temperate mountains of Japan. There are at least 21 species of them. The majority of medical research monkeys are rhesus macaques which were originally from India but now are raised on monkey farms and labs around the world. More is known about the anatomy, physiology, and behavior of rhesus macaques than any other primate except for humans. The Rh blood type system was even named after them. The second subfamily of Old World monkeys, the Colobinae, include the colobus of Africa, and the South Asian langurs and proboscis monkeys . All of them are herbivores. The colobines lack cheek pouches. They also share in common the fact that they have sacculated stomachs. That is to say, their stomachs have "saccules," or sack-like compartments, in which bacteria and unusual combinations of enzymes break down plant cellulose, thereby providing more useable calories. Their stomachs also contain more acid than do those of other monkeys. This speeds up digestion but results in delicate stomachs. The Colobinae have unusually long intestines that increase the absorption of nutrients. These are all adaptations to a predominantly low protein, fibrous leaf diet. Not surprisingly, the Colobinae are also referred to as the "leaf-eating monkeys." Among Vietnamese douc langurs and some other colobine species, their abdomens are often swollen from intestinal gas, making even males appear to be pregnant. The proboscis ("nose") monkeys of Borneo have a peculiar form of sexual dimorphism. Adult males develop a long Pinocchio-like nose. Let us take a moment to review the framework of monkey classification. To begin, they are members of the Haplorrhini suborder along with all of the apes and humans. However, the New World monkeys are sufficiently different from the others to warrant their placement in a separate parvorder (Platyrrhini). The Platyrrhini are commonly divided into two families. The Callitricidae are the most primitive monkeys. The Cebidae are larger and are also the only primates that have prehensile tails. Both families are almost entirely arboreal and vegetarian. The Old World monkeys are divided into two subfamilies. The Cercopithecinae have ischial callosities, cheek pouches, and are omnivorous. The Colobinae are herbivorous and have sacculated stomachs as well as elongated intestines that efficiently process leaves high in difficult to digest cellulose. Many of the Old World monkeys spend much of the day on the ground rather than high up in the canopies of forest trees like the New World monkeys. NOTE: During the mid 17th century, French colonists brought vervet monkeys from West Africa as pets to the Caribbean Islands of St. Kitts and Nevis. As a result of turmoil caused by the French and English wars of the 18th century, some of these vervets escaped. Their descendents have multiplied rapidly over the last 30 generations because there were no natural predators on St. Kitts and Nevis. Today vervets outnumber the population of 40,000 people and regularly cause havoc by boldly eating much of the agricultural crops. In response, the national government now offers a $20 bounty for each vervet that is killed. So far this locally popular action has not stemmed the growth in the vervet population. Copyright � 1998-2014 by Dennis O'Neil. All rights reserved.